In July of 2015, amendments to the Massachusetts Rules of Professional Conduct took effect. The revisions covered a wide range of issues, including post-trial communications with jurors. Such commuication is specifically governed by Mass. R. Prof. C. 3.5(c). 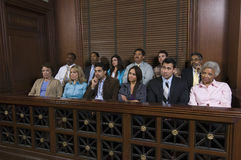 The revised rule now permits lawyers to contact jurors after their discharge without first securing leave of court (as was previously required by the old rule) so long as (i) the communication is not otherwise prohibited by law or court order, (ii) the juror has not made known to the lawyer (directly or otherwise) a desire not to communicate with the lawyer, and (iii) the communication involves no misrepresentation, coercion, duress or harassment. The facts of Moore are as follows: the defendant had a trial by jury in 2012 and was convicted of four offenses, including first-degree murder. During the course of the trial, issues regarding possible exposure of the jurors to extraneous influences arose. In 2015, two weeks after the effective date of the amendment to Rule 3.5(c), Moore’s appellate attorney communicated by mail with the jurors who had deliberated at Moore’s trial. “[T]he Commonwealth [then] filed an emergency motion for judicial intervention to prohibit post-conviction inquiry of the jury.” After a hearing, the judge reported to the Appeals Court the five questions at issue here. Question 5: “‘If the answer to question four is ‘yes,’ in light of Commonwealth v. Fidler, are attorneys required to seek approval from the court prior to contacting jurors?’” SJC’s response: “We answer the question no. As is the case with attorneys who, pursuant to rule 3.5 (c), seek to communicate, post-verdict, with jurors discharged after July 1, 2015, attorneys who seek post-verdict contact with jurors who were discharged before July 1, 2015, may do so without permission from the court. However, and again as is true of attorneys seeking contact with jurors discharged after July 1, 2015, any proposed contact is subject to [a] notice requirement,” i.e., an attorney planning to communicate with jurors must notify the opposing party (or counsel) of her intention to do so. Although inquiries cannot be made specifically into the content of juror deliberations, the fact that it is now possible to freely communicate with jurors and ask them about their impressions of a case is extremely helpful. Knowing what evidence they found to be persuasive, what they thought about various aspects of the trial, and what they believed to be most effective (and ineffective) in terms of case presentation is an extremely useful tool that attorneys can now utilize. If you or a loved one is facing a criminal charges and anticipate going to trial, you too can reap the benefit of this change to the rules. Attorney Daniel Cappetta is an experienced trial attorney who is always looking to use creative ways to advocate for his clients, and maximize his effectiveness. Call him for a free consultation and find out what his skills and creativity can do for your case.